This week my wife has written some extremely insightful, practical and helpful posts about the issue of children coming to Christ for salvation at an early age. These writings would be extremely helpful for parents and anyone who works in children’s ministries. Having received Christ as my personal Lord and Savior at the age of five, this is a subject very dear to my heart. 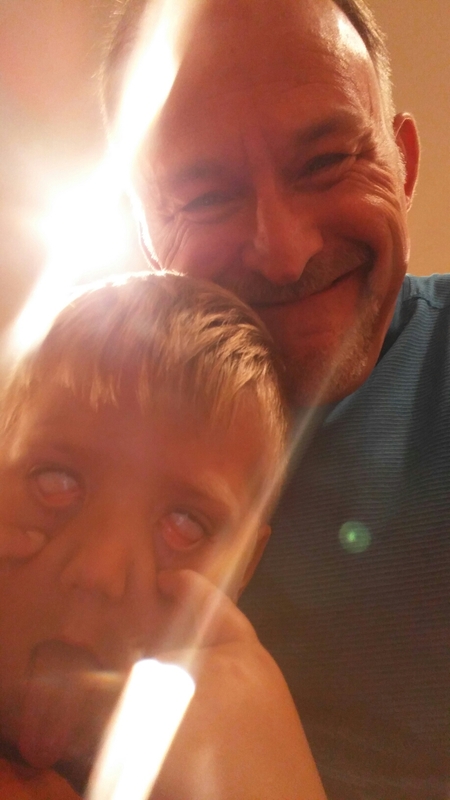 As a pastor, I have had the joy of seeing many children born again over the years. How precious is a tender heart coming to Christ in simple faith, taking God at His Word. May I Introduce You To . . . . .
What is your purpose in life? Please answer before you read on. When He (God) saved you, He saved you to do what? To walk in relationship with Jesus Christ so that everybody who meets you meets Him. Therefore, you have a definite purpose in your life for being saved besides going to heaven. That middle sentence arrested my attention and churned in my mental mill all day long. When I was a young boy on into my teen years, I traveled with my dad to many preacher’s meetings and Bible Conferences. He always introduced me to as many preachers as was around him. What a privilege to shake their hands, both men of renown and lesser known men, and to hear many of them preach. Some of them even stayed in our home. My life was and continues to be enriched by being around such men. Just as my father would introduce me to those men, those of us who know Christ as our personal Lord and Savior have the greatest privilege and purpose, to introduce Jesus to those who meet us! In all of life, it does not matter if others know us or remember us. What matters is if they are introduced to Christ through us! If when they meet us, they meet Jesus! I am crucified with Christ: nevertheless I live; yet not I, but Christ liveth in me: and the life which I now live in the flesh I live by the faith of the Son of God, who loved me, and gave himself for me. (Galatians 2:20). People will meet Jesus in us when . . . When we have met with our God in prayer in the morning and live in the atmosphere of prayer throughout the day (Matthew 6:6-13; 1 Thessalonians 5:17). When we love Him with all of our heart (Matthew 22:37-40). You talk about the ones you love such as your spouse, kids, or grandchildren. What about the Lord? When we walk in the Spirit (Galatians 5:22-23). The Spirit’s number one responsibility is to point to Christ, so when we surrendered to the Spirit in us, Christ is magnified (Philippians 1:20). When you choose to personally live for Christ alone (Philippians 1:21). When we love others as Christ does (1 John 4:12). When we verbally tell others about Christ in fulfilling our purpose of the Great Commission (Matthew 28:18-20). When you talk of Him in conversation, not to show off, but because He is your life (Colossians 1:27). So, as you go about your day today, who will others meet . . . you or Christ? Who is the most important? There she lay. Her earthly labors were over. Her bodily tent had been comfortably tucked inside a beautiful, stained wooden casket adorned with a regal spray of flowers. Her days here were over, but her life in Heaven had only just begun for all eternity on Saturday (John 14:1-6; 2 Corinthians 5:7-8). As her pastor approached the podium, he read from Proverbs 31 and then described her life by two words, one of which was, investments. An investment is “an act of devoting time, effort, or energy to a particular undertaking with the expectation of a worthwhile result.” This dear lady, 83 years old, had spent most of her making investments . . . into people. She invested . . . The gospel into lost souls of every walk of life not matter who they were, the color of their skin, or their lot in life. Time and energy in prayer crying out to the Lord. Time and effort in prayer crying out to the Lord for the salvation of her husband. God heard and answered her prayer! The Word of God into her children, her grandchildren, and her Sunday School class by her teaching and her example. In her pastor by encouraging him and praying for him. Jesus came, died on the cross, and rose from the tomb to make an eternal, soul-saving investment in any one who would receive Him (John 1:12). Barbara Chandler, a devout follower of Christ, made investments in others for the cause of Christ to lead others to Christ because Christ lived in her (Colossians 1:27). I never knew her in this life. No matter, even in death, she made an investment in me. What are your plans in 2017 to make investments in people, to make a difference other’s lives, to make those eternal investments? I believe it’s called laying up treasures in heaven (Matthew 6:19-21)! She has lovingly taken care of her husband since his dementia diagnosis in 2005. Now he lies in a hospital bed at home in their beautifully decorated sun room with full-blown Alzheimer’s. Demonstrating her marriage vows, she wipes his face, pats his head, speaks to him in terms of endearment, cleans up his bed, combs his hair, and listens for any signs of life. Sunday evening, my wife, another couple, and I stopped to sing Christmas carols to them. She had the bar counter prepared with Christmas goodies and fourteen cups set out waiting to be filled with warm apple cider or hot chocolate. In the midst of her trial, she had gone to great lengths to prepare for company. I was saddened that she expected a “small crowd,” and it was only a very small crowd of four. Wow! I mean, wow! Here’s a lady whose life is consumed with the care of her husband, and she intentionally prepared a large meal, invited guests to her home, and all for the purpose of sharing the gospel. In the midst of caring for her born-again husband suffering from the awfulness of the sin-curse and will one day know no more pain or memory loss, she reaches out in compassion to those who will suffer for an eternity in hell, if they do not receive Christ as their personal Savior (John 1:12; 3:16-17). When he saw the crowds, he had compassion for them, because they were harassed and helpless, like sheep without a shepherd (Matthew 9:36). And of some have compassion, making a difference (Jude 22). Wow! Now that’s a troubling, profane trio! I like shopping at Target. They have spacious aisles, a quiet atmosphere, good product selection, and usually decent prices. I love Starbucks. The coffee is outstanding, the conversation around the tables is engaging, the staff is usually friendly, and it’s a genuine coffee shop. I love the holidays. Thanksgiving and Christmas are tops in my book right under Good Friday and Resurrection Sunday. And they are holidays filled with happiness and joy. Matt. 9:10 And it came to pass, as Jesus sat at meat in the house (Matthew’s), behold, many publicans and sinners came and sat down with him and his disciples. Luke 14:1 One Sabbath, when he went to dine at the house of a ruler of the Pharisees, they were watching him carefully. Jesus mixed and mingled among sinners, and as you read on in Luke 14, you see it was for the purpose of calling men and women to be His disciples. His last command before ascending into Heaven was, Go and make disciples (Matthew 28:19-20). Indeed, Jesus renounced sin, but He called sinners to repentance (Luke 5:32). I am greatly disturbed by some of the decisions of Target, Starbucks, and the general pushing of Christ out of Christmas. I must say something and stand against unrighteousness. Nevertheless, there is a divine call that supersedes all of this—Jesus came to seek and to save that which was lost (Luke 19:10). I have that same divine command upon me as do all disciples of Jesus Christ. We have what the people in Target, Starbucks, and the whole world need (John 3:16-17; 2 Corinthians 4:7). Bottom line. The greatest way to curtail sin, unrighteousness, and unholy living is the gospel. As I say to our congregation so often, you do not go to the grocery story just to buy a gallon of milk. You go with a heart for people, looking for the Lord to connect you with some precious soul that needs Him. It is so wrong to condemn the world for living what they are, and then not sharing what they can be in Christ. So, if your conscience does not condemn you, go ahead on over to Starbucks. Get a cup of coffee, and don’t grumble about the price. Then, engage in conversation with someone to build a relationship that will lead to sharing the gospel that day or in the future. As I have heard and repeated many times, the gospel changes everything. Oh, and you’ll have a happy holidays, too. The focus of my blog posts this week has been on our Grace Giving Missions Sunday at BCBC. Truth is, every day of our life is a focus on the grace of God because by grace we are saved (Ephesians 2:8-9) and by grace we operate in life (2 Corinthians 9:8). Grace is God giving us what we do not deserve. Grace is the principle upon which God operates in our life. Therefore, these “coupons” we clip are gifts of His grace to undeserving people who stand in Christ alone, redeemed, justified, and forgiven (Romans 3-5). I certainly do not deserve such a godly, Word-filled, hard-working, caring, loving, lady of prayer and faith as my wife! For 35 years we have been working by grace on our marriage. One of the things that she has seen fit to do through the years is to make our house a home. A man cannot do that. Only a woman with her touch can make your home a place where you are accepted, love, and . . . fed as the picture shows. 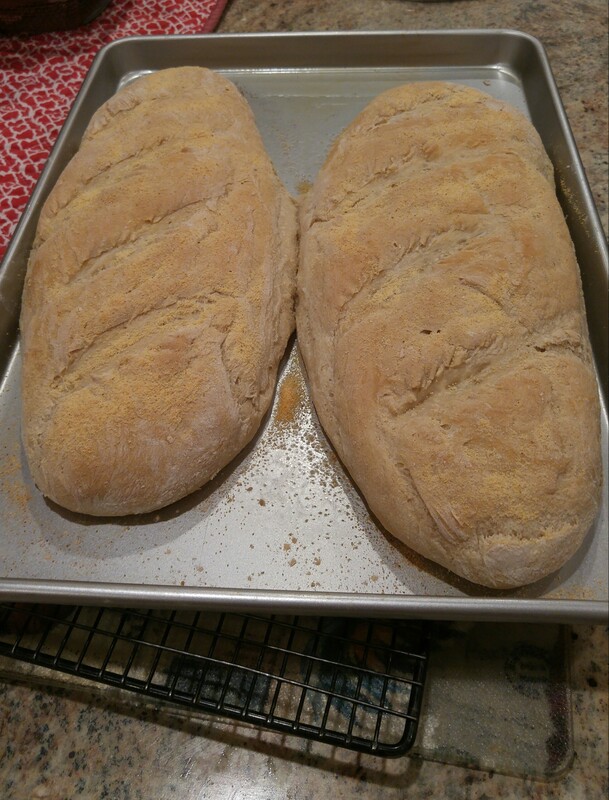 How cool to walk in the house this week and see fresh homemade French bread on the counter. She knows me so well. In moments she said, “You want a piece? Get some butter.” Wow! What a grace blessing Denise is to my life in so many ways!! How awesome to hear the testimony of teens coming to Christ for salvation!! How awesome to hear when anyone comes to faith and repentance for salvation through Christ alone (Five Questions), but to hear about precious teens in their public schools coming to Christ is super-awesome!! My friend, there are no schools, work-places, government, or countries closed to the gospel (Romans 1:16). My, my, my what a thrill to hear of fifteen students getting saved in one school! Wow!! Glory!!!! When you reach my age, you are able to look back over your life and rejoice in the people God put in your life to make spiritual and ministry life investments! Yesterday, we were able to have lunch with two faithful, glowing, caring servants of the Lord who made those investments in us while we were serving in Indiana from 1986-2000. One of the awesome blessings to our hearts is that these two servants have not really retired. 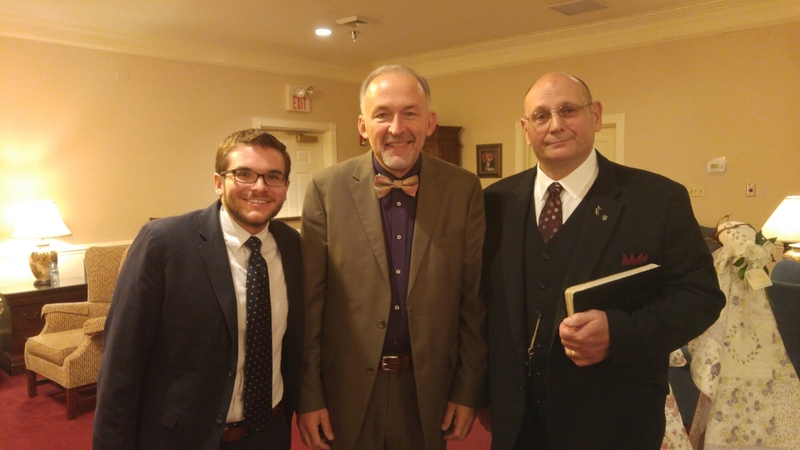 Dr. Taylor is no longer the senior pastor of Colonial Hills Baptist Church, Indianapolis, IN, but he teaches a seniors Sunday School class and supports his pastor and the ministry that he loves so dearly. 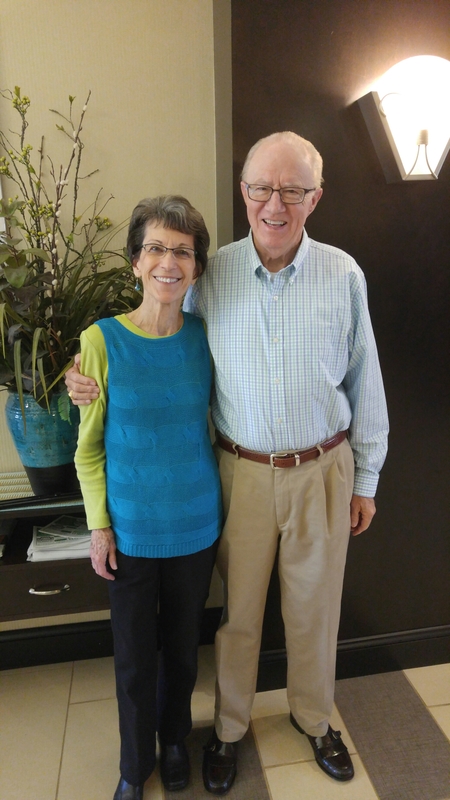 His dear wife, Joan, continues to serve alongside him in the class just as she has done for many years. These folks are investors, champions, encouragers, and trophies of God’s grace! It was one of those moments!! I’m seated on the front row of our church auditorium Sunday morning as we watched an Operation Christmas Child video. Within seconds I was captivated. There I viewed precious children wearing huge smiles of joy as they received and opened their shoe boxes! Greater still was the testimonies of children who had received Christ as their personal Lord and Savior as a result of this initiative. Then I realized that these children were not only gripping my heart, but it was touching the hearts of many around me. Our church is buzzing with excitement this month as we participate for the first time in OCC!! Missions is the heartbeat of God! Look at the cross and empty tomb. 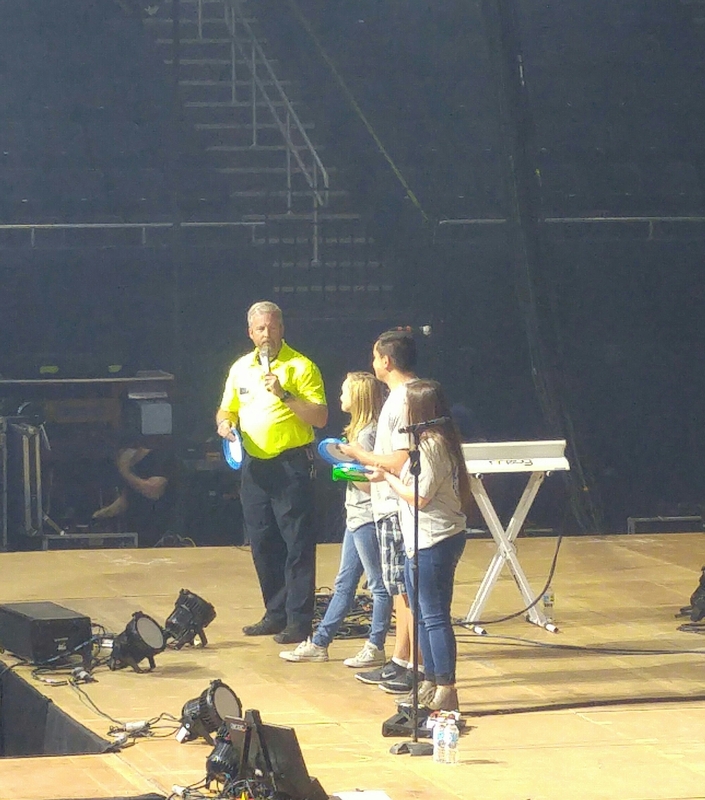 Prior to the OCC presentation, one our church members shared the good news of God’s working in another missionary endeavor in Salt Lake City, Utah. What a thrill to see and hear the testimonies of children and adults declaring their desire to be publicly identified with Christ in baptism; announcing their decision to follow Christ and be His disciple! One adult, newly saved, walked in off the street, asked to be baptized, and the tank was filled during the morning service so this “Ethiopian treasurer” (Acts 8:26-38) could be obedient to the Lord!! Missions is the heartbeat of God! Look at the cross and empty tomb. What is missions? In its most direct and simple form, missions is Matthew 28:19-20, Go therefore and make disciples of all the nations, baptizing them in the name of the Father and of the Son and of the Holy Spirit, teaching them to observe all things that I have commanded you . . . . Furthermore, Psalm 96: 3 says, Declare his glory among the nations, his marvelous works among all the peoples! Also, For God so loved the world that He gave His only begotten Son, that whosoever believeth in Him would not perish but have everlasting life (John 3:16). Missions is the heartbeat of God! Look at the cross and empty tomb. How wonderfully blessed to be a part of a church that is involved in the heartbeat of God! This month, our focus is on Grace Giving Missions, the means whereby we support these and other missionary endeavors each year. My challenge today in this post is really directed to our church family. As you seek the Lord in prayer this week for what He would have you give each month for missions, would you ask yourself this question, “What is my heartbeat for missions?” Before you answer that question, take a long look at the cross (Matthew 27:27-54). Then stand for a while at the empty tomb (Matthew 28:1-10). Do you have God’s heartbeat for missions? Matthew 16:26 says, For what is a man profited, if he shall gain the whole world, and lose his own soul? or what shall a man give in exchange for his soul? The Lord placed more value on a man’s soul than the wealth of the world. I believe those moments like Sunday morning in church are a result of your heart beating like God’s heart because missions is the heartbeat of God! In the days and months to come, we will be fulfilling these goals in feeding the poor, serving others in the public schools, public offices, restaurants, and college campuses, going door-to-door, serving through our Sunday School classes, basketball tournament, community clean-up, etc. The response of our people was so very encouraging today!! Thanks for all your suggestions as well! A great illustration from Scripture as to how love works is found in the account of the Good Samaritan (Luke 10:25-37). We as a body of believers will do as Jesus said, “Go and do likewise” (10:37). 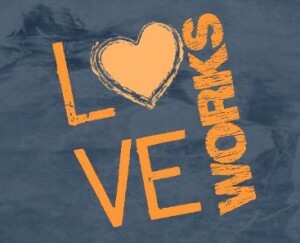 Love works, and it all begins in earnest next Sunday in the community around our church!! “How can we reach a world we never touch? How can we show them Christ if we never show them love? Just to say we care will never be enough . . . I wonder, what will your response be this week, each day, to reach a world desperate to know the love of God? May I offer a few suggestions? Take a loaf of bread to your next door neighbor as an act of love and kindness. Invite folks to your house for coffee and dessert. Take a baby gift to the folks down the street celebrating the birth of their child. Walk through the ICU waiting room, introduce yourself, and ask if you can pray with them as a gift of love and compassion. Do some project for someone that lives near you or works with you as an act of genuine love. Fix a meal and deliver it as a gift of love.